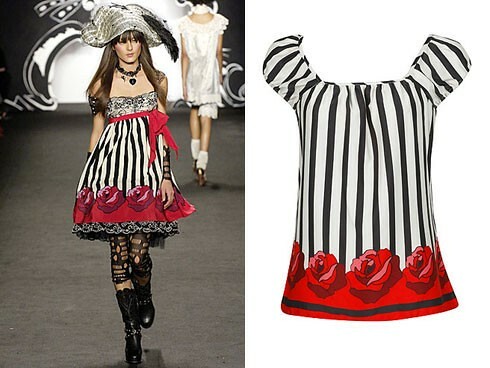 Forever 21 has been accused of stealing designs since 2007, when they were dealt lawsuits from Anna Sui and Gwen Stefani, among others, after those designers discovered items that looked suspiciously like their own designs. I occasionally shop at Forever 21 and initially passed the issue off as indicative of an unscrupulous fashion director who would soon be sacked. However, by 2009, Forever 21, had received over 50 lawsuits and it appears that copying designs, as well as procedures of what to do when caught, are integral parts of their strategy. For one, Forever 21 only targets designs by smaller labels and designers. Entities like Chanel or Louis Vuitton are too powerful and work too hard try to defend their designs to try to copy. Second, they seem to have an actual plan (though they of course deny it) in place when a designer issues a complaint. A designer, Virginia Johnson, recently discovered a copy of her skirt on sale at Forever 21. Upon calling the company, she was initially offered 10% of the sales of the skirts in restitution. When that amount was dismissed, they then offered her 22.5%, which she accepted. Of course, they have excuses for why copying seems to be so ubiquitous from this particular brand. For one, they claim to have little control over their suppliers. Coupled with is that one of company's founders, Jin Sook Chang, is the sole person in charge of approving items. It is up to her alone to approve up to 400 pieces a day, leaving very little time for verifying their originality. Their are several things I think the company can do to prevent crossing the line from "inspired by" to "copied from." The first, which is something they claim to be doing, is hiring a design team to create designs in house. This would help them gain full control of what their suppliers are creating. The second would be to try out a strategy that many other fast fashion retailers are utilizing, designer collaborations. Target has been the best about it, introducing a new designer collection every couple of months through their Go! International line. Others, including H&M and even JCPenney, have also utilized collaborations. So now, rather than making enemies out of designers when they copy designs, they can be working with those designers to create truly original pieces. Finally, just hire more approval people. That's too much for one person and by hiring a team of people passionate and knowledgeable about the fashion industry (as well as capable of doing research) can help to avoid unintentional copies. 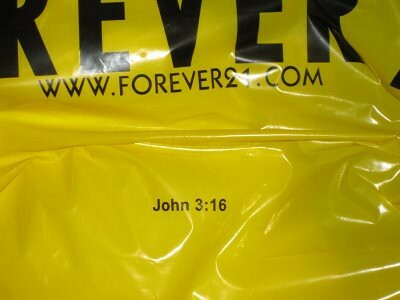 I'm really surprised at Forever 21 for having exhibited such an attitude towards copying, especially considered the strong Christian values the company was founded on, but they can be better and I hope they realize that soon.